This is an amazing turkey stuffing recipe with lots of savory and sweet additions. I love a bit of fruit in my bread stuffing. 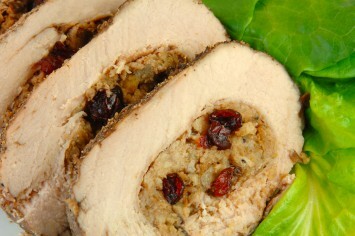 It goes well with turkey or chicken (or even pork) and adds great flavor. This recipe has three fruits – apples, dried cranberries and raisins. The recipe also calls for onion, garlic and celery. You really can’t make turkey stuffing without onions and celery. There is something about celery that adds a nice savory flavor to the dressing. I think family and friends will love this one. Don’t forget to rate it, Pin it, and Like it on Facebook please. Place the raisins in boiling water for 5 minutes, then drain well. Add the raisins to the bread crumbs. Meanwhile, sauté the onion, garlic and celery in the butter. Add these vegetables, including all of the melted butter to the raisin mixture, then add the remaining ingredients. Mix it all together well. Use this bread dressing to stuff your turkey. Stuff part of the dressing in the large cavity and the rest in the neck cavity. Bake according to the size of your turkey. Find turkey baking instructions here. Makes 12 cups of turkey stuffing. Don’t stuff your turkey until just before you cook it. Serious bacteria can develop if you leave a stuffed turkey out for any length of time. Remove the stuffing from the cooked turkey soon after it comes out of the oven. Don’t refrigerate the turkey with dressing in it. As above, you can get quite sick from bacteria buildup. So scoop out all of the turkey dressing before you store the leftovers. I use the herb savory in my turkey stuffing recipe. It can be difficult to find for some reason. If you can’t find it or don’t want to use it, simply leave it out. Use this stuffing recipe to stuff chicken breasts, turkey breast or pork loin too. It’s fantastic with any of them. You will find another stuffing recipe here.